Sunday Fun Day Giveaway: Flat Out & Last Week's Winners! So as I mentioned, summer days often meals cool and light meals. Who wants to be in a hot kitchen anyway? Well, this week's Sunday Fun Day Giveaway will make it easier to whip up a quick and summer friendly meal. But first, an introduction. My friend Jenn, the fabulous foodie blogger of Eating Bender, and I met awhile back at a food bloggers dinner at TRU restaurant. Since then, we've kept in touch and happened to run into each other at the National Restaurant Show a couple months ago. She's currently working with a delicious food company called, FlatOut Breads. Flatout was founded in 1998 by restaurant owner Stacey Marsh. Headquartered in Saline, Michigan, the folks at Flatout aim to provide delicious flatbreads and crisps that are also nutritious. Flatout products not only taste delicious, but they are affordable, versatile, and nutritious. They come in a variety of flavors, sizes and there's something for every taste! Now if you're thinking these are just the typical flatbread wrap, think again! Flatout flatbreads have received some impressive awards for how nutritious they are. They've been awarded 2009: America's Healthiest Food (by Health Magazine). If you're on Weight Watchers, Flatout flatbreads is a Weight Watchers friendly item too. Thanks to Jen, I had a large sampling of Flatout products to try. From the flatbreads, Foldits, and the EdgeOn Crisps, what we've had so far were all very good! We haven't had a chance to get to all of the products since Jen was super generous (thank you Jen!) but we've made a handful of wraps with the original and Italian Herb flatbreads. The traditional country Foldits were perfect for wraps my son could eat and the sea salt EdgeOn Crisps were perfect with dips to snack on. We can't wait to try the rest we got, but so far, it's been a family pleaser! I especially like that Flatout flatbreads have made some meals easier. We've mainly used them for quick and healthy lunches but also enjoyed wraps for dinner on hot summer nights. So this week's Sunday Fun Day Giveaway is compliments of FlatOut Breads. A winner will receive some Flatout goodies to enjoy! What's in your favorite wrap sandwich? Deadline: Saturday, July 16, 2011 at 12 midnight CST. 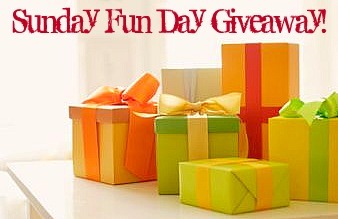 One winner will be randomly chosen by Random.Org's Interger Generator based on the number of your comment and will be announced on Sunday, July 17, 2011, within next week's Sunday Fun Day Giveaway. Good luck! I love rolling up peanut butter, banana, and honey in a wrap for breakfast! Maybe chicken salad......preferably an interesting salad! There is nothing better than a chicken, bacon, ranch wrap. Yummy! I ma so excited to win!!! Thank you so much! I love a spinach wrap with arugala, fresh mozzarella, red peppers, and a basil sauce. Turkey, spinach, sundried tomatoes and ranch. My go-to lunch is a wrap made with garlic hummus, turkey lunch meat, provolone, loads of fresh spinach, some red bell pepper and cucumber. I throw them into a flour tortilla because the options at my market are limited, but I think they would work well with the FlatOut products, too. My favorite wrap sammy would definitely be chockfull of spinach, some grilled chicken, tomato, green pepper, black beans, and salsa for flavor! I love a PB/banana wrap for breakfast, or a turkey wrap loaded with veggies and ranch for lunch! I love a PB/banana wrap for breakfast or a turkey wrap loaded with veggies and ranch for lunch! chicken salad or chicken bacon ranch with tons of lettuce! yummy! I love a Mediterranean wrap with hummus, sundried tomatoes, olives and assorted veggies. Healthy & delicious! I'd love a chicken salad wrap right about now. I love a chicken caesar wrap! Turkey and provolone with spinach, tomatoes and guacamole. Yum! I like tace wraps, filled with seasoned ground beef, beans, and taco fixings. We love to use Flatout wraps and fill them with PB and apple slices. Sometimes we add granola and raisins. i love to wrap avocados, tomato, roasted onions and garlic with some sprouts and feta! yum! Quorn Chicken, Avocado, Hot Pepper Jelly, Smart Balance Mayo, Lettuce and Tomato on Flatout Flax Multigrain Flatbread. I eat this at least once a week. SO GOOD!! My most favorite wrap is a Greek wrap with some red onion, feta, turkey or chicken, basil, etc. etc. I wrap up egg whites with avocado and american cheese! I like a wrap smeared with hummus and filled with cucumber, tomato, and broccoli slaw - super filling, low-cal, and meat/dairy-free! I love turkey breast, hummus and whatever vegetables I have on hand. My fav is lettuce, tomatoes, cucumber, avocado, olives, honey turkey and some chipotle sauce. My favorite is bacon, lettuce, tomato, avocado, blue cheese, and hard boiled egg. Mmm I love wraps! Currently, my favorite fillings include: sliced turkey (I love Boars Head cajun turkey breast), Sabra basil pesto hummus, lettuce, and tomato! Simple, but tasty! I love a wrap with hummus, olives, lettuce and tomato. So yummy! My favorite is guacamole, spinach, grilled chicken or turkey, tomato, red onion, banana pepper and cheese in a wrap! turkey, lettuce, tomatoes, and cheese. My favorite wrap is turkey, spinach, and jack. I had no idea about Flatout Breads other products - I was only familiar with the wraps. I'll have to keep an eye out for those Foldits. My fave wrap right now is ham slices, cream cheese, and green onion.